The scenery of Glacier National Park is often compared to Switzerland and the Swiss Alps. Nowhere is that more true than in the Many Glacier region in the northeast part of the park. In the photo below, the beautiful Swiss-chalet style Many Glacier Hotel sits on the edge of Swiftcurrent Lake, dwarfed by the spectacular mountain scenery in the background. Even more fantastic sights can be reached by hiking trail or tour boat, or a combination of both. Guided horseback trips are also available. One of the most scenic and popular park attractions is the Grinnell Glacier and (lower) Grinnell Lake below the glacier. The beautiful lake has a turquoise color resulting from the glacier’s meltwater. You can hike to Grinnell Lake from the trailhead near Many Glacier Hotel in 3.4 miles (one way) with a 60 foot elevation gain. It takes 5.5 miles and a 1,600 foot gain to reach the Grinnell Glacier Overlook. You can combine the hikes with a scenic boat tour which reduces the hiking distance substantially (lake hike becomes 0.9 mile one way, glacier hike, 3.4 miles one way). The tour includes a cruise across Swiftcurrent Lake, a 400 yard walk to Josephine Lake, and a cruise across that lake to the point where you pick up the trails. Ranger and concessionaire guided hikes are available in conjunction with the boat tour. It is a sad fact that in the past century most of Grinnell Glacier (and other park glaciers) has melted away. In the past 25 years the melting has become extensive due to global warming. As the glacier shrinks away, Upper Grinnell Lake at its base becomes ever larger. See the USGS-NOROCK photo study, Grinnell Glacier from Mount Gould 1938 – 2013. It’s highly likely that all of the park’s glaciers will melt away completely in the upcoming decades. Another popular attraction is the hike to Iceberg Lake. The beautiful lake sits in a basin (Iceberg Cirque) with a sheer 3,000 foot wall as a backdrop (photo, right)! Its glacier has long since melted but the lake holds a flotilla of icebergs well into the summer. The trail starts near the Swiftcurrent Motor Inn, and is 4.8 miles one way, with a 1,000 foot elevation gain. Along the way you will pass beautiful Ptarmigan Falls. Ranger-led hikes to Iceberg Lake are available. 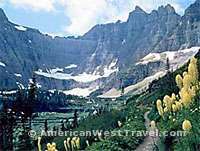 The Swiftcurrent Pass Trail passes through a very scenic valley rich in wildlife. Redrock Lake and Falls is 1.8 miles from the trailhead near the motor inn, with a 100 foot elevation gain. The trail eventually starts to climb the Garden Wall reaching Swiftwater Pass on the Continental Divide after 6.6 miles and a 2,300 foot elevation gain. The Granite Park Chalet and the Highline Trail are another mile further. The Swiftwater Nature Trail is an easy 2.5 mile level trail around the lake. Numerous other exciting hikes are available. The Many Glacier Ranger Station is near the campground. The ranger can offer more suggestions based on your skill level and condition. Strong hikers shouldn’t miss the hike to Ptarmigan Lake and Ptarmigan Tunnel. Also, check for the current program and activity schedule. Information is also available at the Many Glacier Hotel. Moose are especially common in the Many Glacier region. They often can be seen grazing right along the road. Do not approach too close, especially if there is a female moose with its calf. And if you go hiking, be aware that grizzly bears are common to the area as well. Be sure to carry bear spray on any hike. On the Swiftcurrent Pass Trail in Many Glacier. Many Glacier. Late May to late September. Extremely popular campground in a spectacular scenic area. Campground fills very early in morning during the summer. Large campground on east side with 110 sites (13 sites can accommodate up to 35 foot RVs). Water and flush toilets. Take spur road west from US-89, north of St. Mary. Mostly wooded sites. Showers at Swiftcurrent Motor Inn. Activities and programs at nearby Many Glacier Hotel. Area has great day hiking and excellent chances to see wildlife. Access to fee-based concessionaire shuttle bus. The Many Glacier Ranger Station is open daily June to September. Maps and publications are available for sale. Rangers are present to answer questions, issue backpacking permits, provide emergency assistance, etc. Ranger programs are scheduled at the campground and Many Glacier Hotel. Restaurant, camp store, showers, and laundry located nearby the Swiftcurrent Motor Inn.